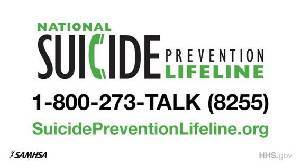 We are very much aware that suicide is a difficult subject to discuss. However, if science has taught us anything about this dark side of the human psyche, it is that silence equals consent. To not talk about suicide is to allow it to pass from the world of the impossible to our world, where we live. This is not acceptable, and we feel that we need to make this discussion happen first. The only reason to not seek mental health care is that not seeking help is a symptom of the disease. Depression is not forever- In most cases, it is a temporary condition which will pass. People may or may not have bouts of depression during their lives. These episodes may be cured or made worse by different medications and substances, so professional care is strongly recommended. DEPRESSION CAN PASS. It does not have to be forever. Tomorrow may very well become the brighter day we all want to see, with some self-care and the assistance of a mental health professional. *I knew you could do it. *Can I sit by you? If you or a loved one is suffering from depression, please seek help. You can find relief from depression either from the resources below or at any health center - Depression is no longer a reason to be ashamed; it is an illness that may or may not pass on its own but can respond to several basic therapies. https://speakingofsuicide.com/resources has a comprehensive list of resources for those having suicidal thoughts, their friends and family, and for those who have survived a suicide attempt or for those who have lost someone to suicide. There are many other fine organizations which exist to help with depression and suicide; this is just a partial list. Our primary suggestion is to seek help to stop depression before it progresses.